I decided to try a couple of new paleo recipes. They are both simple to make but tasted great! The first one was for Salmon Cakes with Garlic Aioli. I was surprised at how true to the recipe the salmon cakes turned out. Moist yet dense. Here they are right before I baked them in the oven. And the Garlic Aioli I served with them had a more fluid texture than I anticipated but tasted great also. Thanks Emeril! 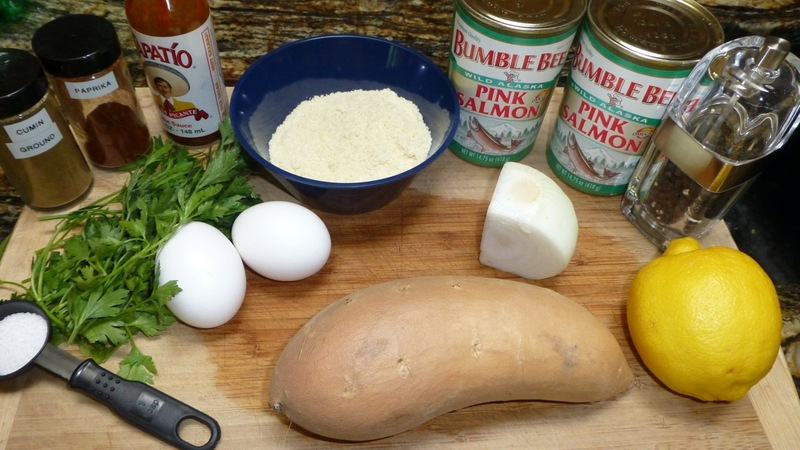 So — here is the salmon recipe so you can try it for yourself. Wash the sweet potato and use a fork to poke holes in it. Bake the sweet potato in the oven at 375 degrees Fahrenheit for approximately 30-45 minutes. A fork should pierce through easily when done. After removing the potato from the oven, let it sit for 15 minutes or so to cool then mash it. Add the almond meal, chopped parsley, onion, lemon juice, hot sauce, salt, cumin, paprika, black pepper and eggs to the mashed potato. Open the cans of salmon and slowly turn the can upside down and dump the salmon in your hand. With the other hand, halve the salmon and remove the bones from the inside. At this point, you should remove any skin that’s on the outside also. Add the salmon to the other ingredients and mix thoroughly. Using a 1/3 measuring cup, scoop out evenly sized salmon cakes until you have approximately 12 patties. Chill the mixture in the refrigerator for a minimum of 30 minutes. Heat a large frying pan over medium high heat. When it’s hot, add 1 tablespoon coconut oil for every six patties. Let the oil completely melt until the pan is very hot then slowly add the patties and cook for 4 minutes on each side. This was truly a great recipe! I made 6 and froze 4 patties. My patties were a little larger as once I had them in the frying pan, I flattened them out. Very very good. I served these with Sweet Potato Fries. Another simple but goodly recipe. Special thanks to EverydayMaven for these delicious salmons!